Hotel Aretusa Vacanze, Siracusa. 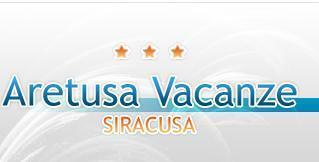 Aretusa Vacanze Hotel Siracusa. The Aretusa Vacanze, a 3-star facility entirely restored in 2004, is located in the heart of the historical centre of Siracusa, more precisely in the Ortigia island, a few steps from Arethusa spring and Piazza Duomo (Cathedral Square). It is realized in an elegant 17th century palace and provides its guests with top of the line comforts and services. The rooms are all extremely spacious and well-equipped with latest amenities, such as private bathroom with shower, satellite LCD television, kitchenette, fridge, hairdryer, air-conditioning/heating, free Wi-Fi Internet access and direct telephone. The facility offers its guests e-mail and laundry service, common terrace with deckchairs and tables, as well as a convenient car park (upon request).Thanks to its quiet and privileged position, the facility offers superb views of the sea and the roofs of Ortigia.